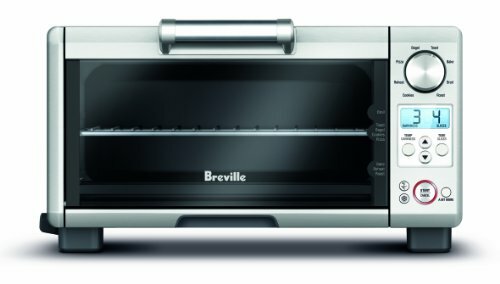 This Breville BOV450XL mini smart oven is an appliance designed with the customer in mind. As the name suggests, this product is small in size, but it can perform a lot of functions that normal wall ovens can perform. It fits nicely on small kitchen countertops of even the smallest kitchens, due to its smaller cubic foot. It also takes very less time to cook and is very easy to use because of its brilliantly designed user interface. BOV450XL has dimensions of 16x13x19 inches and can fit an 11 inch pizza and 4 toast slices. According to my researches, I think this model is the best one of the compact toaster ovens. This oven contains four heating elements which are made of quartz. Two of these heating elements are situated at the top and two are at the bottom. The good thing about these heating elements is that they are independent of each other and can be turned on and off without affecting the other element. This helps when heat is to be provided only at some specific location and at some specific time. The Element IQ is a brilliant technology used by Breville in many of their ovens. This mini oven also uses the Element IQ technology. This sophisticated heating system helps distribute the heat consistently throughout the oven to provide efficient cooking. This happens with the help of the four individual heating elements which can turn on and off independently when needed and provide heat only where you require it to be provided. Breville BOV450XL Mini Smart Oven with Element IQ has 8 pre-set functions designed to perform different tasks. These functions are: toast, bake, broil, roast, cookies, reheat, pizza and bagel. Each of these functions is programmed with a suggested temperature and cooking according to general needs. But this is not where this ends. The user can easily change these settings to personal requirements. These functions are very easy to use because the interface is very user friendly. The functions can be changed by just turning a knob. The settings can be also customized very easily. The oven contains four buttons. The settings can be customized by pressing the ‘temperature’ and ‘darkness’ buttons while the arrows for ‘time’ and ‘slice’. These settings will remain in the oven memory until you unplug the oven. This mini oven also contains a button which, upon pressing, adds additional time to defrost and frozen food the user might put in the oven. Another button added to this mini oven is the ‘a bit more’ button which adds some more time to the cooking cycle so that the food gets cooked properly. The Breville BOV450XL Mini Smart Oven with Element IQ uses 1800-watt power at maximum. This is distributed among the four heating elements and unlike other ovens, which contain heating elements that can only be turned on and off. This oven can adjust the wattage depending upon the requirements of the food being cooked. The door of Breville BOV450XL also contains the guide to the position of rack as the cooking results are significantly affected by the position of the rack. The oven comes with baking pan which is an added accessory. The look of the oven is very stylish and is very handy when it comes to cleaning because of its non-stick interior and an easily removable pull-out crumb tray. The body is made of stainless steel and contains a tampered glass door. It has 3 rack positions inside. For perfect cooking results, it is recommended that the top position should be used for broiling, the middle position for toast, bagel, cookies and pizza while the lower one for baking, reheating and roasting. The interface contains an LCD which calculates the right time and temperature for cooking. It turns orange during preheating and cooking and turns blue once the cooking is done. It has a lot of features that larger ovens have and due to its smaller size, it also takes lesser amount of time during preheating and also for performing other tasks. What Do Consumers Think About The Breville BOV450XL? The strong, durable construction and eye-catching shape makes this oven well received by consumers and it is also very easy to clean because of its non-stick interior which can easily bear high temperatures for a long time. Space Saving – Breville BOV450XL is a praised mini oven which can even fit inside the smallest kitchens. Under normal circumstances, small sized ovens can’t perform functions that larger wall ovens can perform however this is not the case with Breville BOV450XL. It can perform a variety of functions so some customers say that they do not necessarily need a larger oven. Element IQ – This oven has been correctly named as a smart oven because of the genius features that it comes with. Almost Every consumer using this model loves the Element IQ Technology offered by Breville Company. The Element IQ along with the four quartz heating elements provide consistent heating throughout the oven and can even be changed whenever required according to the needs of the food to be cooked or personal taste. Unlike other toaster ovens, the heating elements of BOV450XL are composed of quartz which responds more quickly to the heat change to provide even heating and smooth cooking. User Friendly – Another feature which really impresses the users is the simple and user friendly interface. This helps a lot when cooking new recipes and when the user simply wants to try something new. Also, the functions which are programmed with recommended settings can be changed and they are stored in the memory of the oven as long as it is not unplugged. Reheat Function – The reheat function in the oven is another advantage of this product as it uses the top and bottom heating elements which can be turned on and off to reheat the leftover food. This makes it natural and provides far better results than microwave ovens. Extra Convenience – This model also comes with surprises that make owners quite satisfied with their choice. ‘A bit more’ button is a very useful feature of this mini smart oven as when pressed it adds some more time for the food to cook perfectly. Another surprise of this oven is that the sides do not heat up when working like most other ovens. In my research, I found that Breville BOV450XL does not have a lot of cons. It is a little overpriced as compared to other mini ovens but that is justified with the functions that it can perform. Handle – The handle of the oven is a little big in size and sticks out. This wastes a little space. Buzzer – The buzzer of this mini oven is louder than a user would expect from a mini oven, since it is mostly used in smaller kitchens. It can be annoying for the user to constantly hear a large alarm sound. Rack – Another issue with this oven is that the rack does not slide out when the oven is opened. So, the user has to be careful with hot food. Breville BOV450XL Mini Smart Oven with Element IQ is designed with the user in mind and has a lot of functions that a customer does not usually expect from a mini oven and gain an overwhelmingly high customer satisfaction rate. So, if you can afford it and you have a small sized kitchen, you should definitely take this one as it can also perform like a normal wall oven. Its performance will never disappoint you.